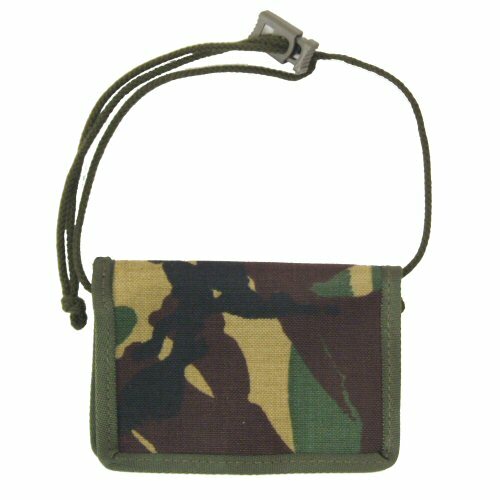 Folding pass or personal ID pocket for wear around the neck. 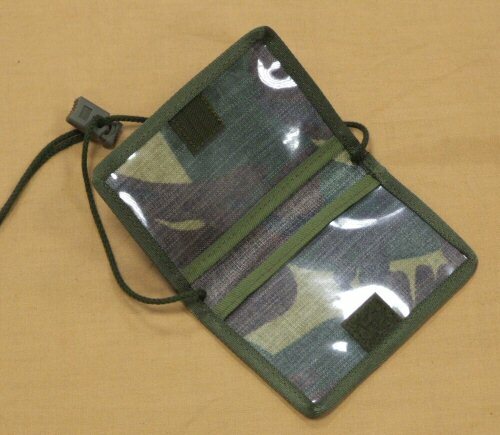 The pass pocket is so designed as to be folded away when not in use within an IRR texturised DPM cordura shell. This helps to protect privacy and also allows for the carriage of two ID cards. Folded away, the pocket is of a low profile so as not to create discomfort should heavy clothing be worn over it. The neck strap has an adjustable toggle to enable the pass to be carried at a certain height. The folded pocket is retained in its position by velcro tabs. View of the pocket opened. The pocket has two velcro tabs to help close the wallet when not required.